A polemic /pəˈlɛmɪk/ is a contentious argument that is intended to establish the truth of a specific understanding and the falsity of the contrary position. Polemics are mostly seen in arguments about very controversial topics. The art or practice of such argumentation is called polemics. A person who often writes polemics, or who speaks polemically, is a polemicist or a polemic. The word is derived from the Greek πολεμικός (polemikos), meaning "warlike, hostile", which comes from πόλεμος (polemos), "war". The author uses the definition from the Random House Dictionary in the preface of this book which he believes is the one which describes what and how he is writing—but I believe the one I gave may be a little bit easier to understand. Rational, in my opinion is what each individual perceives rational to mean. What is rational thinking to one person may not be rational to another. His arguments against religions which are based primarily on faith versus being able to see and feel with the senses for the most part have some validity. Those of you who believe in Faith will never understand his point of view. But then these are his opinions, not yours necessarily. As all of you are, by now, I am sure, aware, I always allow others to have their own opinion whether I agree or not and do not become angry or upset if those opinions differ from my own. Richard Todd Devons certainly writes about controversial topics from a view point that most readers will probably not agree with. He does, however, give very rational reasons and examples supporting his points of view whether it is on religion or the death penalty or prostitution. The fact that I could give just as rational reasons for opinions opposing his is beside the point. I am not here to “debate” his point of view—just read it and consider it. I did find this book interesting but concede that it is not for everyone. 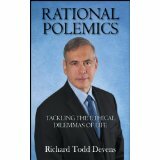 Rational Polemics is a provocative, controversial, outrageous book that dares to challenge the ideas and values that most of the world has been spoon-fed from infancy onward. With personal anecdotes, tongue-in-cheek humor, and refreshing candor, author Richard Devens thinks outside the traditional strictures of convention and morality, and asks important questions, including: Does poetic justice exist? Is forgiveness always the best method to achieve closure? Do we have the right to end our own lives? Should drugs be legal? Can prostitution be beneficial?” If you’re ready to consider the true nature of evil, to look at the hypocrisies inherent in religion, to think about whether humanity really is “a higher form of life,” and to open your mind to new ideas about subjects ranging from adultery to cannibalism to rude people and distracting background music, Rational Polemics will be a welcome breath of fresh air from a writer who might be one of the most original thinkers of our time. This book can be purchased at Amazon. That is the author on the front of his book! Richard Devens is a classically trained pianist, piano instructor, and writer. His article “What is Talent?” appeared in the September-October 1992 issue of Piano Guild Notes. Earl Wild-The Romantic Master, a full-length interview of the late great piano virtuoso, was the cover feature of the November-December 1996 issue. Richard is co-author of the book “Martial Arts for Kids” (Weatherhill, 1997). He has also contributed articles to WUSHU KUNG FU, Official Karate, Karate/Kung-fu Illustrated, and Black Belt. He lives in New York. I always have a hard time choosing a book and most likely go back to the good old romance ... Besides if there is someone like you recommending books like this :) Then I simply have to give them a try! This sounds like a great book! Thanks for sharing! Awesome preface to your book review. Truly, I'd rather read what you have to say about what you're reviewing...it's very interesting. The book sounds interesting but probably not my cup of tea. I have always agreed to disagree when it comes to opinions of others. Thanks for sharing. This is not the type o f book I usually find interesting, but after reading your review, I am very curious about reading more! Thanks for sharing! Not really my kind of book, but good review none the less :) Thanks for sharing it! Not for me but my husband might like this. I will have to ask him and see. Thanks for the review. thank you so much for sharing this review,you made it sound like a worth read :) .. though it's not really the kind of book I would read but i might gave a try..
Great review. I agree with others that this is not a book I would normally pick up. I am wondering if this is a book I would enjoy. This sounds like an interesting book even though it is not something that I would normally read. Last night, I was watching Hannity talking about Zimmerman's case. The show has more than a dozen "white collared" guests/panelists and all of them are Polemics. It was interesting to hear their brilliant minds even though they don't agree. Probably not my kind of read either. I love the idea of the piano training of the author since I am a pianist as well. But this topic seems a little 'off the beaten track'. What if everything we knew was wrong? Now that's an interesting question that makes you think! seems like a very interesting reading. never seen anything like it. This sounds like an interesting read. In the very least, it appears that it will force me to examine my way of thinking, which I think we all should do once in awhile. This os Quite clever writing, wish there was more there..he is quite a talent.noe how to bring Good Luck, to us may be a new one!